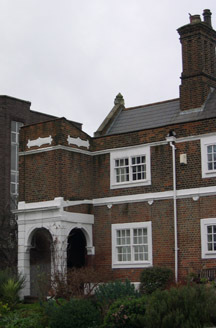 After James died in January 1891 Mary Ann and her daughter, Julia, went to live at 1 Bootmaker Institute, Mortlake, Surrey. This was one of fourteen almshouses built for shoemakers who were no longer able to work or for their widows. They were established in 1836 by the Boot and Shoe Makers' Benevolent Association and were known locally as "All Soles". Today the almshouses and the chapel that was in the middle are a terrace of private houses known as Rosemary Cottages. baptism records of St Paul's, Deptford.